A View of the Mosque, at Mounheer, from the S.E. 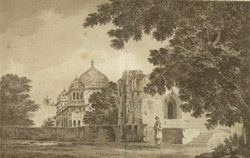 bl.uk > Online Gallery Home	> Online exhibitions	> Asia, Pacific and Africa Collections	> A View of the Mosque, at Mounheer, from the S.E. Plate 18 from William Hodges' "Select Views in India". Maner is a town on the bank of the river Son. It is close to the spot where the river Son joins with the Ganges. The mosque is part of a compound containing the tomb of Shah Daulat (1616). The compound was built by a local ruler during the reign of the Mughal emperor Jahangir (ruled 1605-27). Hodges compared it to a Gothic cathedral for the similarities in the entrance with colonettes and pointed arch. He also found that its 'majestic dome' with its inverted curve was more pleasing than the traditional European type with a crowning cupola.